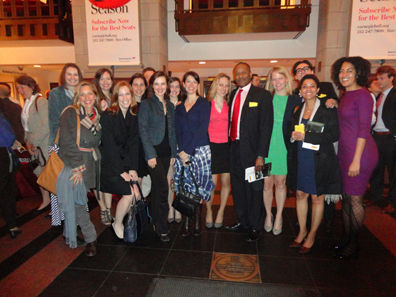 Chapter members enjoyed a night of music at NYC's famed concert hall. NEW YORK -- It was a night of music and culture for 20 Greater New York Chapter members enjoying the Carnegie Hall debut of the Alabama Symphony Orchestra at the Second Annual Spring for Music Festival. The Alabama Symphany Orchestra (ASO) was one of six North American orchestras participating in the six-day festival. The ASO performed its New York premiere of the pieces commissioned from Paul Lansky (Shapeshifters) and Avner Dorman (Astrolatry) and a spirited interpretation of Beethoven's Symphony No. 7. "The music was amazing and the crowd’s unequivocal enthusiasm was like nothing I have experienced before, said UANYC's Jennifer Randazza. "Carnegie Hall was packed with many proud current and ex-Alabama residents who joyfully listened and enjoyed a stellar performance. It was truly an event like no other and not one that I'll soon forget." Under the leadership of Music Director and Principal Conductor Justin Brown, the ASO featured five musicians with Alabama ties -- Alabama grad Sarah Nordlund (First Violin), Daniel Szasz (Concertmaster & First Violin), Jay Evans (Principal Trombone), John McElroy (Principal Trumpet) and Judy Sullivan Hicks (Principal Harp). UANYC worked with Emily Moore, ASO Annual Fund Manager, to secure tickets for the event. Following the performance, chapter members gathered at Flute in Gramercy for a post-event reception.